A flyer for the U.S. Environmental Protection Agency’s EnergyStar program proclaims this startling fact: The average building wastes 30% of the energy it consumes due to inefficiencies. How is this happening in 2015, when we’ve got sophisticated building management systems (BMSs) that enable companies to clearly identify and address sources of energy waste? Two big culprits in commercial and industrial buildings are HVAC controls and systems, which the U.S. Dept. of Energy says accounts for up to 60% of a building’s energy use, and lighting, which consumes about 20%. Take steps to reduce those two and you’re well on your way to real savings. 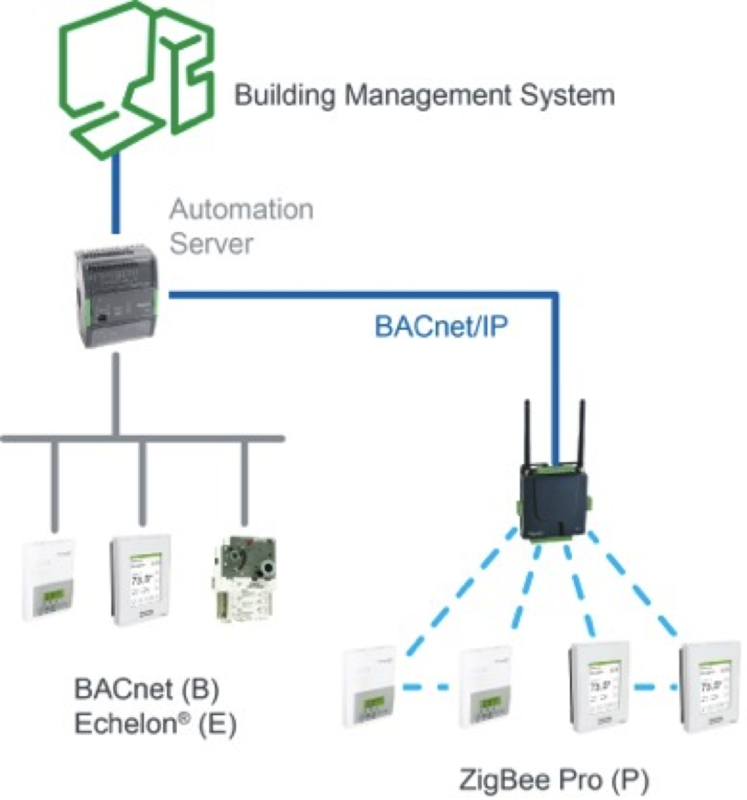 What may be holding companies back from implementing a comprehensive BMS is fear that the cost of wiring their buildings for all the required sensors and room controllers is impractical and expensive. It’s also quite disruptive to install in an existing building. But just as most office buildings today use wireless networks to connect IT equipment, wireless technology is now viable and cost-effective for BMSs. 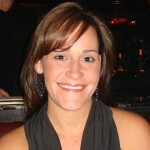 In fact, it is changing the playing field for building owners. That’s because building automation applications generally require small amounts of bandwidth and can withstand some delays, unlike voice or video. As a comprehensive (and free) Schneider Electric white paper makes clear, wireless BMSs even offer many advantages over their wired counterparts. The paper, titled “Leveraging Wireless Technology to Reduce Building Energy Costs,” outlines three major reasons a building owner may opt for a wireless BMS vs. a wired one. First is ease of installation. Wireless devices require no renovation, working through ceilings or repainting – meaning there’s no disrupting building occupants. What’s more, many wireless devices can be added to the building’s wireless network automatically, with the push of a button. Wireless technology is also highly scalable and lends itself to staged deployments. It’s a simple matter to add new nodes, sensors, actuators and controllers to existing deployments, so you can start small and expand as the technology proves itself. Third, wireless technologies are “greener” than wired networks because they typically use less energy and reduce the use of expensive resources, particularly copper. That can help buildings comply with guidelines such as LEED and qualify for utility and government rebates. Just as important in my book, however, is that wireless is reliable and helps enable a sound BMS that gives facility managers greater control over their buildings, from wherever they may be. A new Schneider Electric video illustrates the point well, showing how seemingly simple capabilities like being able to remotely control the temperature in a room can have a butterfly effect. In a nutshell, that’s the idea that a small event, like a butterfly flapping its wings, can cause dramatic changes down the line (check out this previous post for a more in-depth explanation). Take a minute to check out the video here; it’s at once both entertaining and enlightening. The white paper has gained ample exposure and is likewise worth a read. It explains the pros and cons of the two major wireless IoT protocols for building automation – EnOcean and ZigBee – and how they can co-exist even in the same building. 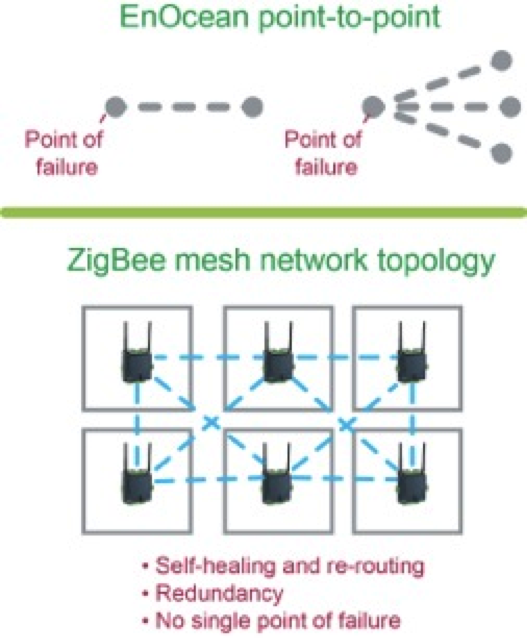 Two major wireless protocols for building automation – EnOcean and ZigBee – can co-exist in the same building. Likewise, you’ll learn how going wireless doesn’t have to be an all-or-nothing proposition; the same BMS can employ both wired and wireless technologies. It’s never been easier or more cost-effective to install a BMS. And as the white paper makes clear, the savings are significant – reducing energy costs by as much as 30%. If your company’s buildings are wasting energy like so many others, hop aboard the BMS train and you can likely look forward to achieving a 30% savings. What are your thoughts on wireless technology and its butterfly effect? I invite you to share them with me below.